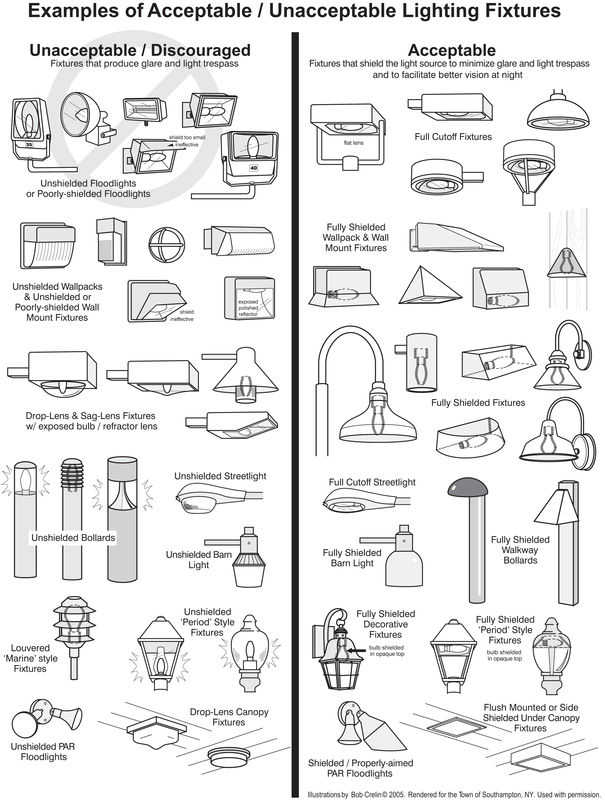 The illustration below provides an easy visual guide to understand the differences between unacceptable, unshielded light fixtures and those fully shielded fixtures that minimize skyglow, glare and light trespass. 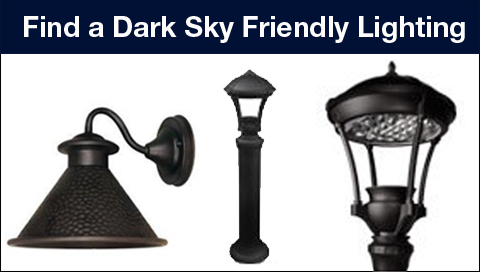 Are you looking for dark sky friendly lighting fixtures? Search our Fixture Seal of Approval database. Most people are familiar with incandescent or compact fluorescent blubs for indoor lighting, but outdoor lighting usually makes use of different, more industrial, sources of light. Common light sources include low-pressure sodium (“LPS”), high-pressure sodium (“HPS”), metal halide and light emitting diodes (“LEDs”). LPS is very energy efficient but emits only a narrow spectrum of pumpkin-colored light that some find to be undesirable. Yet, LPS is an excellent choice for lighting near astronomical observatories and in some environmentally sensitive areas. HPS is commonly used for street lighting in many cities. Although it still emits an orange-colored light, its coloring is more “true to life” than that of LPS. In areas where it’s necessary to use white light, two common choices are metal halide and LEDs. One of the advantages of LED lighting is that it can be dimmed. Thus, instead of always lighting an empty street or parking lot at full brightness, LEDs can be turned down, or even off, when they aren’t needed and then brought back to full brightness as necessary. This feature both saves on energy and reduces light pollution during the night. Because of their reported long life and energy efficiency, LEDs are rapidly coming into widespread use, replacing the existing lighting in many cities. However, there are important issues to consider when making such a conversion. 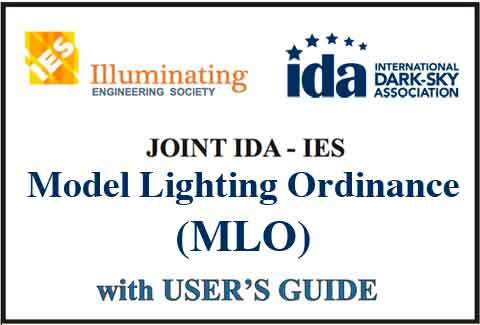 See our LED Practical Guide for more information. As the illustration above, it is crucial to have fully shielded lighting, but we now know that the color of light is also very important. Both LED and metal halide fixtures contain large amounts of blue light in their spectrum. Because blue light brightens the night sky more than any other color of light, it’s important to minimize the amount emitted. Exposure to blue light at night has also been shown to harm human health and endanger wildlife. IDA recommends using lighting that has a color temperature of no more than 3000 Kelvins. Lighting with lower color temperatures has less blue in its spectrum and is referred to as being “warm.” Higher color temperature sources of light are rich in blue light. IDA recommends that only warm light sources be used for outdoor lighting. This includes LPS, HPS and low-color-temperature LEDs. In some areas, the white light of even a low-color-temperature LED can be a threat to the local nighttime environment. In those cases, LPS or narrow-spectrum LEDs are preferred choices. IDA doesn’t sell dark sky friendly lighting, but our Fixture Seal of Approval program makes it easy for you to find the right products. The FSA program certifies dark sky friendly outdoor lighting – these are fixtures that are fully shielded and have low color temperature. Search our database and then check with your local retailer.